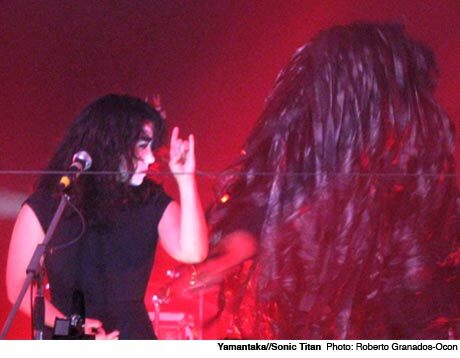 Polaris-shortlisted art rockers Yamantaka // Sonic Titan, joined by Owain Lawson (drummer of Black Feelings and Les Angles Morts), donned white face paint with black markings while the collective delivered a memorable set as the final main-stage act of Friday. Singers Ruby Kato Attwood and Ange Loft entered scene under the guise of a black and white dragon, with Loft leaving on her portion as a black headdress for the majority of the performance. Their symbolic theatrics were subtle, but clearly carefully thought out; Attwood would fashion her hands into various mudras --Buddhist hand positions -- depending on the song. The way the music's heavy, industrial drone fused with the delicately soaring vocals was anesthetizing, which consequently led to the captivation of most and the lassitude of others. In any case, it was a truly unique and innovative aural and visual experience.